You spend 60 minutes each day sorting your documents and media files. You search YouTube all the time for videos you think would be funny. Your blog is littered with posts with titles like “What I Had For Lunch Today” and “I’m Addicted to Blogging: I Keep Writing Even Though I Don’t Have Anything To Write About”. You waste time bashing and criticizing people in their blogs’ comments. Your blog’s layout changes every couple days. You think people are crazy to complain about how much spam they get. After all, you only get a couple a week, right? You have a MySpace account. You buy Vista just so you can play with “Flip 3D” and stare at the “cool” graphics. You’re about to go and play video games for 5 1/2 hours. Video is quickly becoming an important part of the web. Whether it’s for news, stupid videos of cats, or whatever. YouTube is obviously the undisputed king of easy video hosting and browsing (all hail YouTube! ), but it’s got flaws. You can embed YouTube videos on your site, but you have to use their player and have their logos too (among other things). Eat up all your site’s allotted bandwidth. Use low-quality free file hosting. Video files take a lot of space and bandwidth, and free file hosting services tend to put excessive limitations on their services that make it practically impossible to do video. Unless you want to either pay for file hosting, or pay for more bandwidth on your web host (if your site takes off you’d end up needing a dedicated server), you’re stuck with YouTube. It costs you nothing, Google’s paying for all the bandwidth. Of course, you still have YouTube’s player instead of your’s. If you’ve read Macworld before, you’ll probably have noticed the little segment called “What’s Hot”, where they take 5 news headlines (related to computers) and then write comments underneath each (generally amusing/sarcastic/etc comments). Macworld seems to have discontinued the “What’s Hot” segment, unfortunately. While thinking of a recurring feature (think “The Morning Reboot“) I could start, I thought of “What’s Hot”. Why not do something like that every week or so. I could take a couple of computer/web-related news headlines (and possibly quotes) and proceed to comment on them. What do you think? A good idea or not? Got any ideas for a name for the category? Just bouncing ideas around. Wgo knows if I’ll do it. What do you think? Comment away. The cover art for the last Harry Potter book is out! Both the US and UK editions are available in the partially-constructed Gallery of Requirement. The UK cover is more interesting (despite looking more cartoony). It seems to have a hint about the content of the book, while the US cover is just Harry. Borders is currently running a 40% off deal on pre-orders (shockingly I haven’t pre-ordered yet) and Amazon is currently accepting orders at $18 or so. 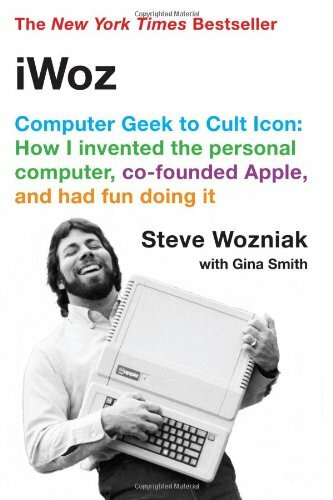 iWoz is sort of an autobiography of Steve Wozniak, and his take on the history of Apple. Try it, you won’t believe what you read. Wozniak not only built the Apple I and Apple II himself, but he pioneered numerous technologies that we now take for granted. Wozniak was the first person to build a computer with a keyboard and screen (the Apple I). He was the first to build a computer with color capabilities. He invented the universal remote. That’s not all, he came up with numerous other things, and improvements on other devices. Seeing as the Apple I was the first computer to have a keyboard and screen and the Macintosh (which Woz didn’t seem to be involved with much) was the first consumer computer with a Graphical User Interface, I can safely say that Apple pioneered two of the most important computer improvements (The Keyboard/Screen, and the GUI. The third would be the Web, but they helped make that possible too with the Mac). Do you like filling out crazy online quizes? You must have seen them. They’re everywhere. They’re slowly taking over the web. What are they? They are online advertisements that irritate the heck out of people. They’re slowly taking over the web. These “commercial-style” ads play before a video clip or game. Where can you see them? Shockwave.com is one example. You click the “Play Game” button and are greeted with, not the game, but a 15-30 second flash-based “commercial” that you are forced to watch before the game starts. You can’t skip or block them, either. The ad carries an embedded command that starts the game. If the ad doesn’t finish playing, the game won’t start. Sure, Shockwave.com gets a ton of cash off these ads, but they annoy everyone. And it’s not just Shockwave. IMDB, for another example, makes you watch an ad before you can view a movie trailer. You can’t skip or block them, either. These ads rarely even approach being useful. You get “shoot-the-ipod” ads, cellphone ads, Ford ads, ad nauseam. At least the commercials on TV are funny sometimes. These new web-based monsters are boring and pointless. Yes, we know Ford exists. We don’t need to be reminded every time we watch a video online. Webmasters, don’t use these….please. They’re nearly as irritating as pop-up ads (and that definitely means annoying). Take a look at the most successful video site on the web, YouTube. Do you see ads like that on there? No! With Google backing them, I’m sure they won’t add them any time soon either. These ads rarely even approach being useful. You get “shoot-the-ipod” ads, cellphone ads, Ford ads, ad nauseam. The solution? Try something like Adbrite’s new InVideo system. Try it out. Not too bad is it? It probably pays less than the “commercial”s, but it doesn’t irritate people. Let’s keep commercials from spreading to the web. Yes! I’ve finally got a working Linux installation. After spending the morning yesterday downloading three of the discs of openSuSe 10.2 and installing it later that afternoon, I finally have Linux installed. How many hours have I spent preparing all this? I’d say nearly 18 hours. I’ve got linux…now what? I plan to download the remaining discs of the openSuSe distro soon (along with some other packages off sourceforge). I’d like to eventually get a cheap 802.11g card and install that too. It would be nice to have internet access. You can’t do much on a computer these days if you don’t have internet capability, can you? Then I’d like to see how little I can use Windows for the duration of a week. I already know of some things I’ll need to do on a Windows machine, but it would be fun to see how little I could use Windows. I was surprised by the packages offered by the openSuSe distro. Several open-source packages I already use on Windows are there (like Audacity). Unfortunately, a lot of these are on the discs I haven’t downloaded yet. Installation of the base openSuSe CDs took ages. I suppose I shouldn’t be surprised, given the power of the computer I was using. As you can see, if I do try to use mainly Linux for a week, it will be a challenge. Not just because of the lack of Windows, but because of the machine’s lack of power. If I do try a “Week Without Windows”, I’ll let everyone know and blog about it as I avoid Windows. Until then, it’s just a cool idea. In my quest to become a published author (published offline. I’m already published online, right? ), I was hurriedly printing stuff out this morning before the mail-carrier arrived. I printed out a copy of my query letter, and a couple envelopes. It was almost time for the mail to get here as I started to put the query and my SASE into an envelope. Suddenly I realized I’d put the envelopes in the printer backwards. The envelopes’ flaps were on the bottom instead of the top. I’d already put stamps on them, and time was nearly out, so I sealed the envelope and ran out to put it in the mailbox. Hehe, man that was dumb. I decided recently to install Linux on an old machine I have (well, actually I decided a couple years ago and haven’t gotten around to it until now). It’s an ancient 488Mhz Celeron with 256MB of RAM and (currently) about 120GB worth of Hard Drive space (spread over two drives). The hard drives in the computer are 20GB and 100GB. The 20GB one has been in there with Windows 98 installed. I recently installed the 100GB one for Linux (dual-boot, yeah!). Installing the hard drive proved to be an unnecessary challenge. First I had to open up an older computer that no longer functions (failed motherboard) and remove the 100GB hard drive so I could put it in the PC that would eventually run Linux. After opening the case, I located the hard drive. There it was in a metal enclosure…in the most idiotic place ever. It was attatched vertically on the front of the case, just below the wires connected to the system’s power button. There was no visible way to remove it. Above the drive were the optical drives, preventing it from sliding upward. After an hour of searching through Compaq’s website and talking with a support guy, I found a page with details on replacing hard drives. Looking at the pictures of different types of mounting methods, I saw one that was vertical. Aha! Going back to the case, I searched around for a little hard to see screw that was just out of reach of my screwdriver. I spent 15 minutes looking for a longer one. Once I found a suitable screwdriver (magnetic, to prevent the screw from falling who knows where inside the computer), I took the screw out. After that, all I had to do was pull the enclosure out with a “swinging motion”, so the hard drive would pivot on this hidden bracket. I quickly took the hard drive out of the enclosure and closed up the computer (it had some more functional cards that might be useful in the future). It was time to install the “new” hard drive. I opened up the computer that would run Linux in the future. Dodging wires, I slid the drive into it’s slot, connected the wires, and set the jumper for SSCE, like the one already in there. I plugged the machine back in and started it up. What? “Primary Master Error”? I must not have set the jumpers correctly. I opened the case up again (after disconnecting the machine, of course). I set the old drive to be the primary drive and the “new” one to be secondary. I closed the case, plugged everything in and…somewhat success. No error, but I had to go into the BIOS. After 15 minutes of work, the BIOS recognized the new drive, and Windows booted off the other one. Time to install Linux easily and live happily ever after, right? Wrong. I put my recently burned Ubuntu 6.10 disc in and rebooted. I was soon greeted with the Ubuntu logo and a set of choices. I hitthe option to start the Ubuntu Live Desktop, where the icon to start the installation was. Okay, the resolution was too high for my old monitor (which can only go up to 640×480 for some reason. It needs to be replaced). I wnet back to the menu. I set it to use 640×480. I got the Ubuntu loading screen and waited ages. Then it X11 started and everything turned brown with vertical lines. The flickering was so crazy I couldn’t see anything, even though the desktop had loaded. I’m guessing Ubuntu isn’t compatible with my ancient motherboard’s onboard graphics. So no I’m downloading OpenSuSe. If that doesn’t work, then I’ll try Fedora Core 1. The local library has a book with a couple CDs with Fedore Core 1, so I’ll try those if SuSe doesn’t work.